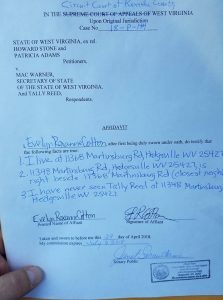 A state court in Charleston, West Virginia will hold a hearing Thursday May 3 at 1 pm on the Tally Reed residency case. The question before the court – where does Tally Reed live? Tally Reed is on the May 8 Republican primary ballot. She’s running against Larry Kump for the House of Delegates seat in the 59th District. Reed claims she lives at a home in Hedgesville in the 59th district. But everyone in Morgan County who know the Reeds know that the Reeds live in Berkeley Springs in the 58th district. Delegate Mike Folk took to Facebook today to lay out the case against Reed. Folk produced a sworn affidavit from a woman who lives next door to the Hedgesville house where Reed says she lives. In the affidavit, the woman says that she “never seen Tally Reed” at the house Reed says she lives in. 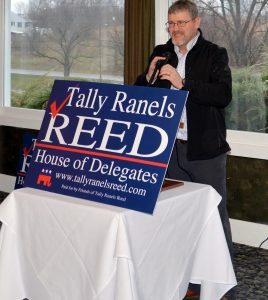 Folk reiterated his belief that Tally Reed was recruited to run in the 59th district by Daryl Cowles (R-Morgan), the Majority Leader of the House of Delegates. Folk said that it was common knowledge in Berkeley Springs that Cowles is friends with the Reeds. “For him to stay silent is one of the most egregious things that he can do as a public official in such a powerful position,” Folk said.